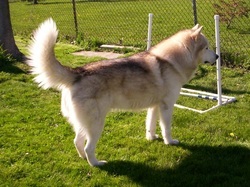 I cannot ever thank his breeders, Roseann and Rich Deutsch of Kloud Burst Alaskan Malamutes, enough for the favor they did in allowing me to bring this kind and gentle boy home. 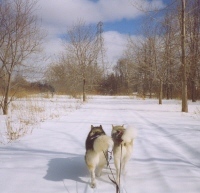 Ashlar was a very good sled dog, as his reaching, free-flowing stride made it easy for him to keep going all day. For a big boy, he was still extremely light on his feet, and yet with the CLEAN movement that I find so desirable in a working dog. He had beautiful side-gait, with no excessive "kick" in the rear- instead moving with an efficient, tireless drive. Ash's fun side was always been just under the surface, though- as evident in his frequent leaps off the ground. He loved both work and play. Ashlar has did a little bit of training in agility- he earned 1 AKC Novice Standard (preferred) leg in June 2006, with a 1st place! He earned both his WTD and WPD in early 2003, and his CGC in 2002. 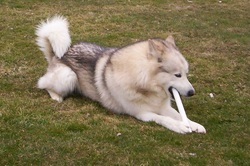 Ash had such a loving character- he was my constant shadow at home, following me everywhere I go. He was like a great innocent- honest in character, and completely without guile or deviousness- it would never occur to him to disobey deliberately...though he did sometimes seem to forget what he was supposed to be doing! 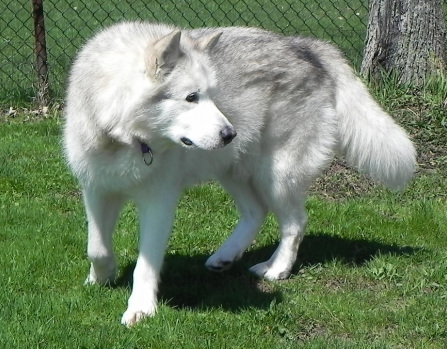 In early 2007, Ashlar suffered a serious back injury from a fall on the ice, leaving him temporarily paralyzed. In light of his injury, I could not see risking his health in trying to attain the final leg toward his weight pulling title- to me, it was just not worth it! We were happy that he could walk again- the fact that he recovered enough to once more enjoy running and jumping in agility is amazing!! He only competed lightly however, so as to not put too much stress on him, and stayed in competition right up into his 11th year, even completing a couple of titles in CPE agility, where he enjoyed the benefit of a very low jump height. He lived a very long life, and was healthy right to the end.